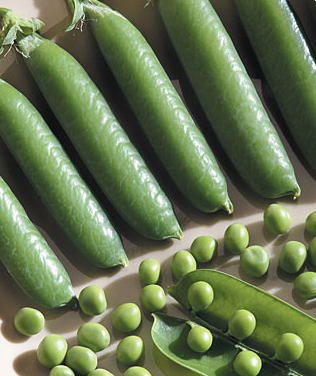 In this part of New England, peas are a traditional vegetable to serve with July 4th meals, as well as in various summertime bar-b-que and picnic salads. 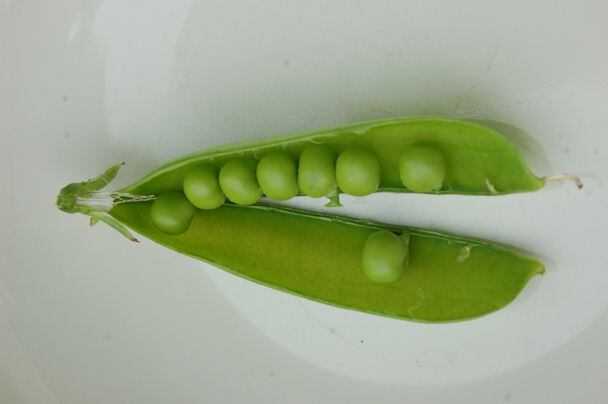 I am sitting here, having just picked my first pod of the year (the pea’s trip to my mouth was delayed only long enough to take the picture), knowing that I will enjoy fresh peas throughout early July. 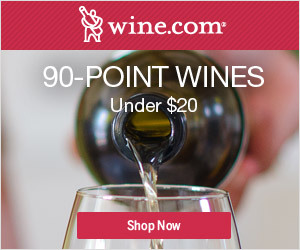 But I have more than that to appreciate. I take advantage of a quite revolution in pea growing that happened over 30 years ago. In the 1970s farmers were finding it increasingly difficult to find enough help to pick peas, one of the most labor intensive crops to harvest by hand. Unfortunately the peas grown at that time were not suited to machine harvesting so a whole new type of pea, but still recognisable as a pea, had to be developed. The end result was the “leafless” pea, although it is more correctly the semi-leafless pea. 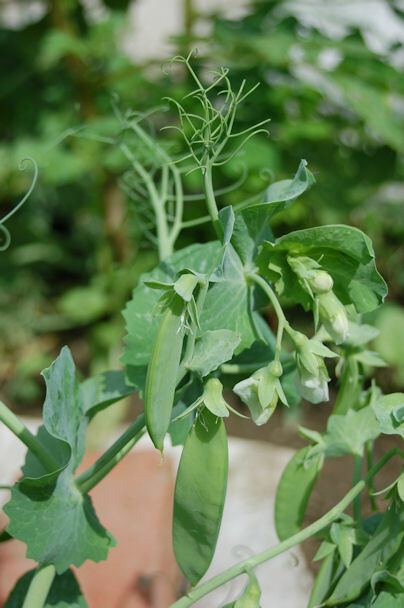 The most noticeable characteristic of these peas is that they have very few leaves on them- hence (semi)-leafless. 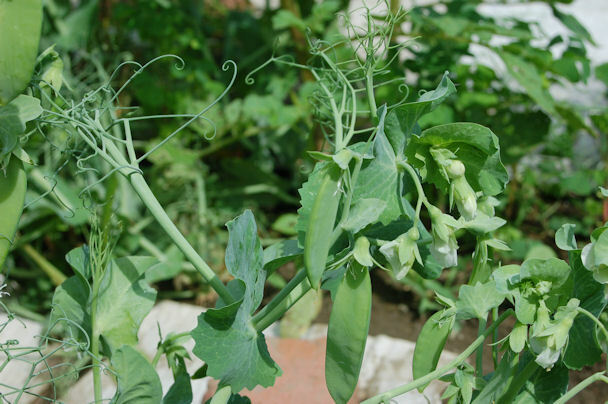 The upper leaves develop as tendrils, a trait that was bred into them from a particular wild type of pea cousin. The result is pods that hang in plain sight, at the top of the plant, making harvest really easy- no moving foliage around to discern green against green! An unintended benefit for me of having the pods so high is that the slugs can’t get to them first! Because all the pods mature together, another trait required for machine harvesting, I will pick the entire crop in about a ten day period (I tend to get a few pods in the first pick, the vast majority in the second, and then a few stragglers on a third pick). This fits perfectly with my busy life as I won’t be going out over an extended period to pick a few pods each time and the garden space becomes available very quickly. Like most people I imagine I will freeze the bulk of the crop and enjoy them over the coming year. It’s the middle of May in New England and winter seems to be finally releasing its grip on the climate! Late last week I was planting onions and leeks and I invited Michaela to stop by as I knew what a leek aficionado she is and I knew she wanted some leek seedlings for her potager. I asked her if she knew about the hill or station planting method of planting leeks. She didn’t, so I promised an explaination. Here it is. 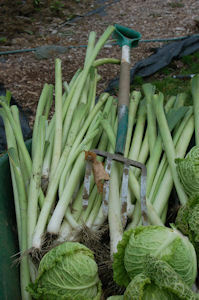 Traditionally, onions were ‘direct’ (sowing where they are to grow, in contrast to seed bed grown and transplanted) sown early in the gardening year, mid-March if possible. The grower then had to patiently wait for the onions to emerge to see what sort of crop he could expect. Patience was necessary as onions can take up to six weeks to germinate in open fields and in that time they were subject to the vagaries of the U.K. weather. Despite its moist reputation, maintaining constantly damp soil for six weeks in the U.K. can be a problem! Coincidental with me being in college, plug production, basically plants already growing in small pots such as those sold in six packs, for field crops was just being introduced. 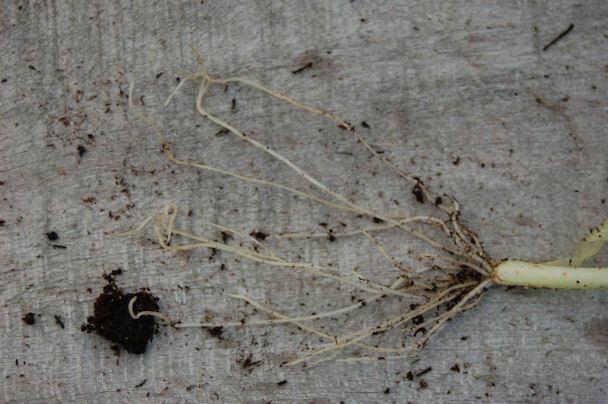 Using plugs a farmer could eliminate the wait time between sowing and emergence and start cultivating the crop as soon as the weeds emerged. 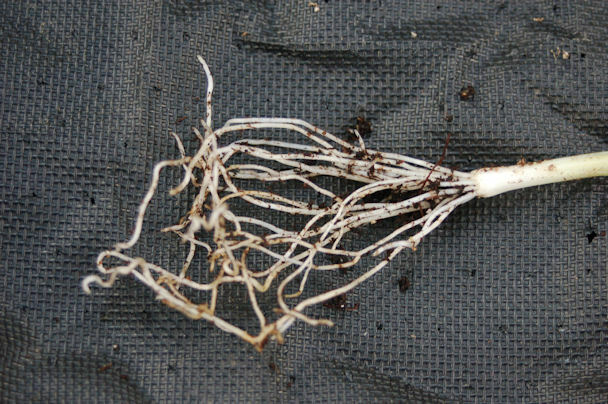 Onions, and their cousins leeks, have very poor root systems so that a single seedling couldn’t hold together a plug very well. 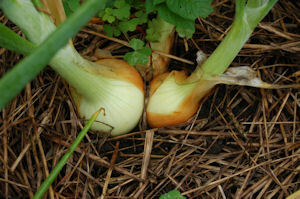 To overcome this onions, initially, but quickly followed by leeks, were multi-seeded into plugs and then the whole plug was planted out into the field. 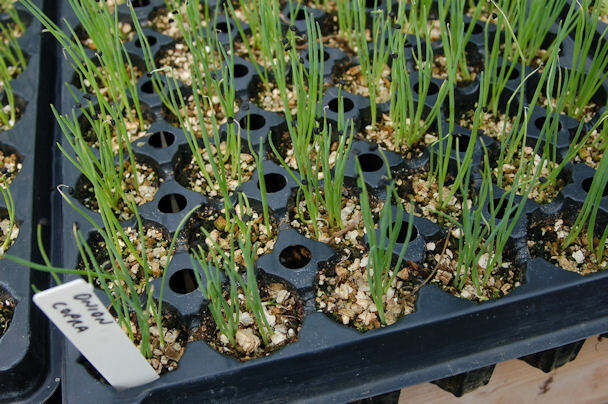 Initially 1 inch plug cubes were used and sown with five seeds so that the plug wouldn’t disintegrate during handling. I have slightly modified this system to suit my conditions. 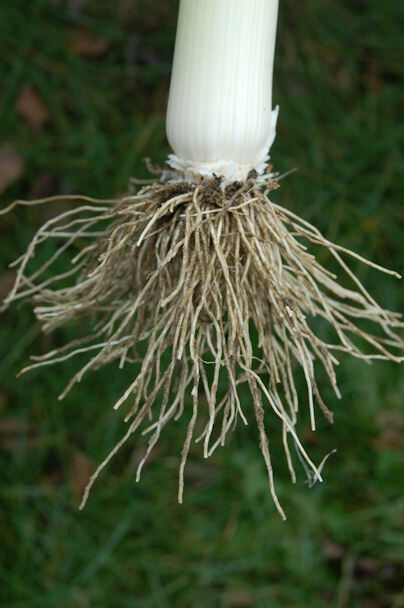 I use 1 inch round plugs, each 2 inches deep, sown with three seeds and then I plant the whole plug as a hill. The suggested planting density for onions is one plant every 4 inches so I put each hill out 12 inches apart in rows 16 inches apart. I just make a small hole in the soil and drop in a plug. This saves me time, fewer holes to make, and causes far fewer broken fingernails! This system also works really well if you are growing through mulch as you don’t have to tease the mulch apart quite as often. Growing onions like this doesn’t give you as many big onions (how big is big? Last winter I did have Farmers Market customers asking me for smaller onions as some were too big for their needs) as you can get when they are grown individually. What will surprise most people though is that this system actually increases total yields compared to planting onions individually. Also, you won’t end up with misshapen onions, due to their being grown so close together, as the swelling bulbs push each other apart as they grow whilst still maintaining their shape. You are currently browsing entries tagged with Vegetable gardening tips at The Gardener's Eden.